If you’re bullish coming out of this Autumn’s correction, then you’re betting that recent lows in the indexes mark significant bottoms. While we at All Star Charts don’t believe Bulls are out of the woods just yet, we’re of the view that if stocks can manage to trade in a sideways range for any length of time, that might be long term bullish for stocks and the economy in general. With this as a backdrop, believers of the bull case should look at Walmart $WMT as a barometer of the American consumer and the willingness of investors to step in and take some risk. 95 is our line in the sand. 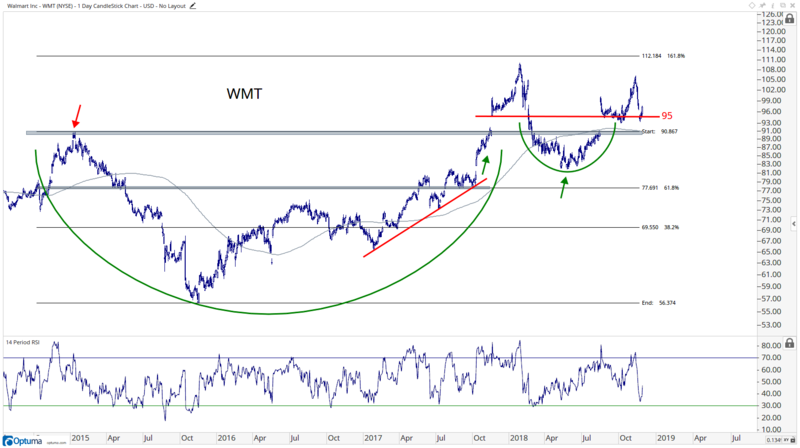 We’re bullish on Walmart as long as it holds above 95 and as long as that remains so, we think $WMT has a legitimate chance at reclaiming all time highs north of $110. We’d like to participate on any upside, but given our mixed market outlook, we want to limit our cost of participation as best we can. As such, I’ve got a play on deck that gives us the potential for unlimited upside that requires a minimal debit to participate, while leaning on recent support to hold. We want to buy the March 110 calls, but we don’t want to pay full price. So we’re going to do a bit of a Capped Risk Reversal play here. We’re going to purchase the March 110 calls (they closed on Monday at 71 cents), but we’re going to partially finance the purchase of these calls by shorting a March 92.50/90 vertical put spread (closed on Monday at 55 cents). The net cash outlay for the debit on the calls minus the credit for the put spreads should be around 16 cents. (It should be noted we’ll be doing an equal amount of all call and puts in this trade). As long as $WMT expires in March above 92.50 (our short puts strike), then the most we can lose in this trade is the debit we paid — 16 cents. Not bad. Below 92.50 our max loss rises to $2.66 — but we plan on being long gone before that happens. If $WMT closes below $92.50 (which is the support going back to October 5th that was successfully retested in early November), then we’ll close our trade and accept our loss. Our thesis is busted and there’s no sense waiting around on the rapidly rising potential for additional losses. As long as $WMT never closes below $92.50, we’ll look to hang on to this position as long as possible into March. 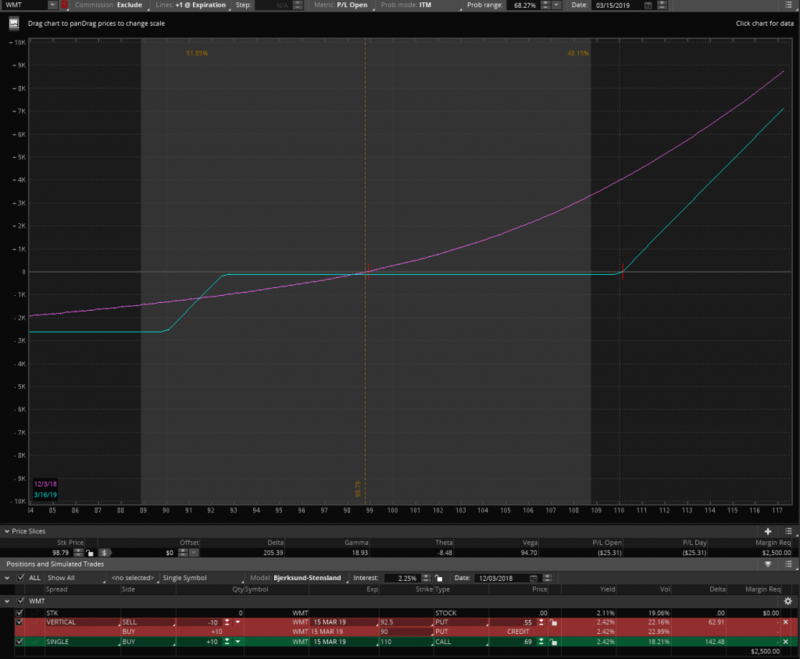 If we never get to $110, then all of our options will expire worthless and we’ll eat the 16 cents loss (the debit we paid to enter this position). If $WMT does in fact get to our long calls strike at $110, then we’ll look to close half our long calls and use the proceeds to cover our entire short put spread. That should leave us cash flow positive on the position with the potential for unlimited gains from there. If we’re still in the position when the calendar turns to March, we’ll look to close the whole trade down to avoid growing theta drag on whatever premium is left in the long calls, or gamma risk on open short puts — unless our calls are WAY in the money (above $115), at which point we’ll get greedy and hold on for the whole Walmart Blue Light Special (or whatever you call large gains in America’s most popular retailer). This is how we roll at All Star Options. If you’d like to join hundreds of other enlightened professionals using ASO for idea generation which leverages the technical analysis expertise you know and love from All Star Charts, you can start here.